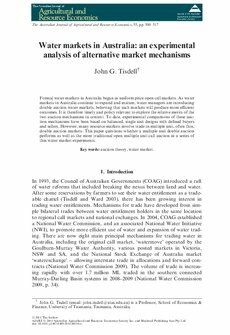 Formal water markets in Australia began as uniform price open call markets. As water markets in Australia continue to expand and mature, water managers are introducing double auction water markets, believing that such markets will produce more efficient outcomes. It is therefore timely and policy relevant to explore the relative merits of the two auction mechanisms in context. To date, experimental comparisons of these auction methanisms have been based on balanced, single unit designs with defined buyers and sellers. However, many resource markets involve trade in multiple unit, often thin, double auction markets. This paper questions whether a multiple unit double auction performs as well as the more traditional open multiple unit call auction in a series of thin water market experiments.